Scratching one thing off the list at a time. This week I finally finished the baskets for my niece’s birthday party. They are in the mail and (fingers crossed) should get there in time. Between those and the Bunting Banner and Party Hats, that is a huge chunk off the list. Here are some great projects I’ve collected from across the blogworld that have been added to The List. I’m always amazed by the generosity of bloggers and awed by their creative talents. I’ll warn you, once you click onto these blogs you can get lost for hours in all of the amazing posts and possibilities they present. Cassie over at drummbellina has the cutest tutorial on how to make up your very own knickers. Honestly, I’d print this out just for the adorable illustrations. I don’t know when and I don’t know how, but I will be finding a reason (excuse) to try out screen printing with Mod Podge. It opens a whole world of embellishments that you can add to any sewing project. 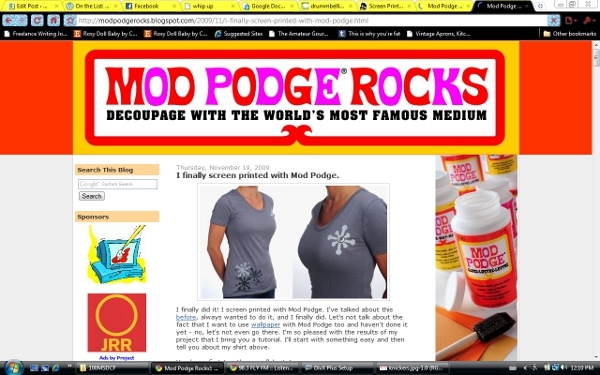 Amy’s spreading the love over at Mod Podge Rocks, and the enthusiasm is definitely catchy. 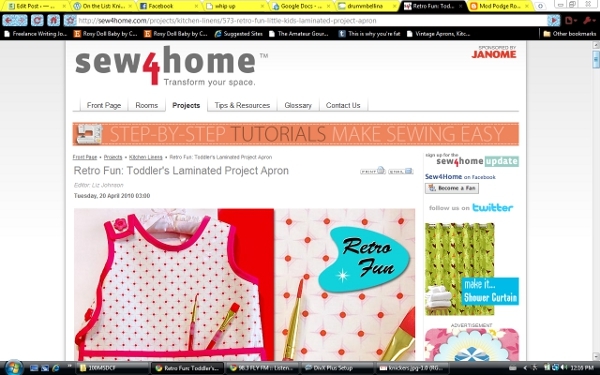 Sew4home has a overwhelmingly cute pattern and tutorial for a retro styled child’s apron. I’ve been seeing laminated cotton all over the blogworld and I think this is my favorite application. It’ll be perfect to help contain some of those messes my niece will be making in the name of creative discovery. Honestly… I kind of want one of my own. 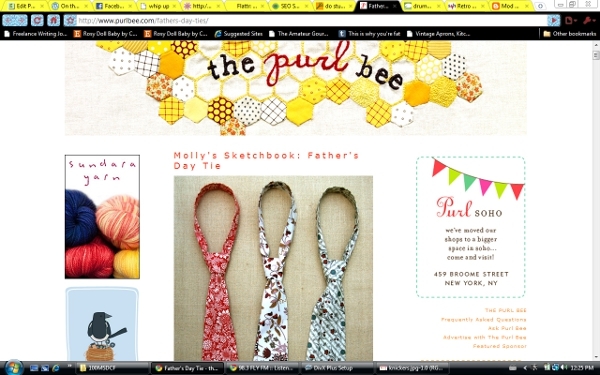 Although Molly from the purl bee posted this tie pattern and tutorial specifically for Father’s Day, I won’t let that stop me. Luke has a few blah ties that I can’t wait to replace. While you’re at the purl bee don’t stop at just this post, they have an amazing wealth of projects covering embroidery, crochet and sewing. 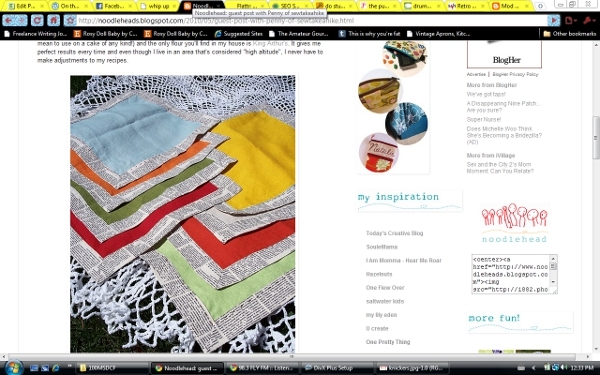 Penny from sewtakeahike spent a little with Anna at her blog Noodleheads and posted this great tutorial for linen napkins. I hate using paper (throw away) napkins. I feel guilty every single time I tear one off the roll. As soon as the fabric store sets up another sale I’m on my way to pick up some linen to finally get these (and my conscious) off the list. Categories On The List: Great projects found on other blogs. 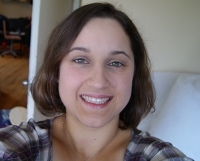 I'm Cheyanne, the face behind the posts. I'm a recently married 26 year old who has found herself in the middle of a hectic life she never expected. My husband and I own two pieces of property that we are renovating, two cats who own our apartment, and two dogs who always want to play fetch. I'm a baker by profession, crafter by love, and sugar artist by inspiration. Thank-you so much for stopping by. I hope you have fun looking around. Feel free to write me a comment or send off an email at offthelistblog@yahoo.com. FYI: Useful information to spark some thinking. 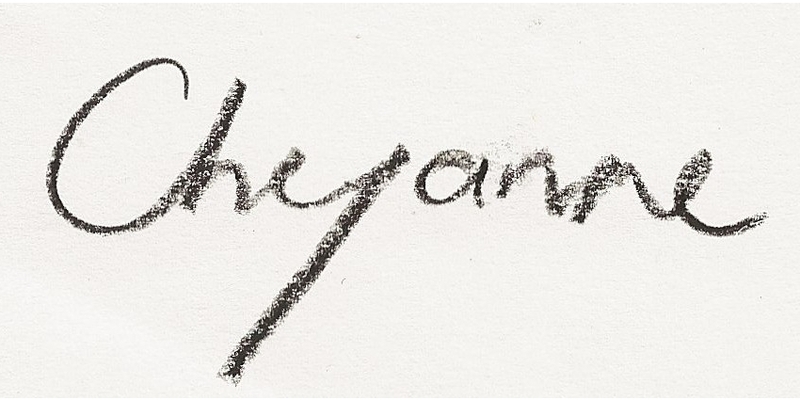 On The List: Great projects found on other blogs. Show & Tell: A quick overview of fun projects. Tutorials: Complete how to, from start to finish. Subscribe to Off the List! Want to keep up with Off the List tutorials and posts?